Michael Bay swoops in with an inanely nonsensical fifth chapter. If Optimus Prime, Autobot leader and all-around metal-masher, really wanted to save humanity, he would have stopped director Michael Bay some four years ago by not letting him make anymore Transformer movies (the bulk of that quote is borrowed from USAToday - sorry, I couldn't resist!) But really, at this point, it just needs to stop. We've had enough. The quality took a huge drop after the first film in 2007 (even though that one was a grand mockery in and of itself). And while it’s not as mind-numbingly stupid as the Revenge of the Fallen sequel back in 2009, it's close. Damn close. 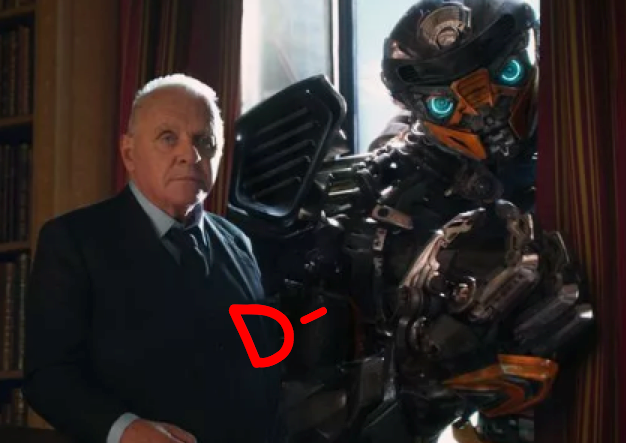 The new fifth installment Transformers: The Last Knight is an exhausting marathon of loud, hot, and long metal-clashing scene after metal-clashing scene, with sad lines and inexcusable characters thrown in. Even if you madly love alien robots decking each other whilst tossing out bad one-liners, it’s a painfully long two-and-a-half hours to sit through where the biggest problem isn’t a lack of plot, but way, way too much of it. And I mean waaay too much of it! I'd say Mark Wahlberg remains a cut above original star Shia LaBeouf. A hero of the last film Age of Extinction, Wahlberg’s "Cade Yeager" is running a junkyard and harboring these Autobot fugitives, like his buddy Bumblebee and cigar-smoking Hound (voiced by John Goodman - and despite the ridiculous cigars, one of the less annoying voices in the film). Despite the utter badness of everything else happening all around us in nearly every single scene of the movie, we can't help but halfway like Cade. But the moment he is no longer in view, we are thrown back into the acidic reality that is this Transformers series. Here, the world has decided that Transformers are illegal to have around. The government, however, has no issues in partnering with evil Decepticon leader Megatron (Frank Welker), though he’s tried to take over the globe multiple times now and failed. But Decepticons aren’t even one of Cade’s major issues; after his allies — including the ever-so-feisty "Izabella" (Isabella Moner) and comic relief "Jimmy" (Jerrod Carmichael) — are attacked by Megatron's minions, Cade is inexplicably snatched away to England to partner with eccentric naysayer and history professor "Vivian Wembley" (Laura Haddock) and oddball lord "Sir Edmund Burton" (Anthony Hopkins). In longwinded fashion, Edmund gives the lowdown on how Transformers have been a part of history since the Dark Ages and how their home of Cybertron is a few days out from smacking down Earth Armageddon-style. Also, something about knights and kings and queens mixed in, but who the heck cares. Also not helping things at all: Optimus (voiced by Peter Cullen) has been turned into the super-bad Nemesis Prime, and Cade’s crew has to find an ancient magical staff, save the planet, and give Optimus a reality check to make things right again. This all requires yet more screentime, which of course makes our butts hurt as we have to sit through it (well, I did, but you don't). Rooting Transformers lore within the annals of modern society — i.e., Bumblebee fighting in Nazi Germany — is at least one more lame idea explored amidst a dizzying amount of trash (but not that we are counting anymore at this point).